Hours: Open Daily from 11:oo am to 6:00 pm. I was born and raised in Southern California. Upon graduation, I attended Cornell University where I studied Biochemistry and Animal Science in the Agriculture College and studied Wines of the World in the School of Hotel and Restaurant College. I continued my studies at the University of California at Davis and obtained a degree in Veterinary Medicine and a minor in Viticulture and Enology. Upon graduation from U.C. Davis, I established my veterinary practice in Northern California. Then, the winery bug came back!!! After taking a few short drives to El Dorado County in the fall of 2000, I began investigating the feasibility of establishing a vineyard and winery in the Fairplay Appellation. After much research and consideration, the Toogood Estate Winery was established on a beautiful 40 acre parcel of rolling foothills purchased in May of 2001. It is one quarter mile square and offers microclimates perfect for the different varieties I’ve hand selected. The project of excavating the wine cave started on September 11, 2001. Nine months later, the excavation and floor were completed. In all, I’ve created over 5000 square feet of winery production and aging space, all under ground in a delicately controlled atmosphere. The first crush of the Toogood Estate Winery was the 2002 vintage. The wine was first bottled in January of 2003 and sales and acceptance have been remarkable. The vineyards currently have 12 acres planted with varieties including Zinfandel, Primitivo, Tempranillo, Pinot Noir, Merlot, Cabernet Franc and Petite Sirah. The 2002 vintage wines available are Sangiovese, Primitivo, Tempranillo, Merlot, Syrah, Cabernet Sauvignon, Walker Vineyard Zinfandel, Claret and my signature wine, Foreplay, which is a wonderful and provocative red wine. 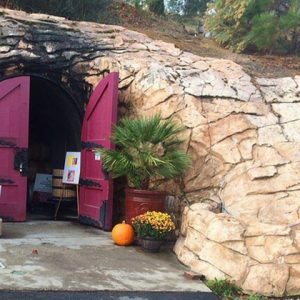 Our Wine Cave Tasting Room, Zinfandel, Barbera, Tempranillo, Syrah, Petite Sirah, Malbec, Cabernet Franc, Cabernet Sauvignon, Alicante Bouschet, Merlot, Pinot Noir, Sangiovese, Exquisite Red Blends, & numerous Ports.